June 7, 2016 – Before small steps and giant leaps, there are big dreams, and the Space Foundation Discovery Center has special programming this summer for people of all ages who have big dreams. Summer of Discovery is back for its fourth year at the Discovery Center, and this year’s theme is “Heroes of Space.” Weekly programs will celebrate the Visionaries, Scientists, Engineers and Astronauts whose big dreams led us into space. Summer of Discovery features special space-themed summer programming for all ages. Visit the Discovery Center weekly, Tuesday through Saturday from 10:00 a.m. to 4:00 p.m. Extra activities and presentations will be offered on Saturdays. On June 11 and June 18, our Super Saturday activities will focus on the ways that creativity inspires space travel — build and launch straw rockets, see Science On a Sphere, try some creative crafts. And there will be guest presentations between 11:00 a.m. to 2:00 p.m. on Super Saturdays. The Visionaries theme will continue through June 24, followed on June 25 by a new theme – Scientists. The featured exhibit for the summer is Super Kids Save the World, presented locally at the Discovery Center by Pikes Peak Children’s Museum. This interactive exhibit is designed for children ages two through 10 years, and helps them learn that by taking simple steps in their daily lives, they can become eco-friendly superheroes in their own communities. 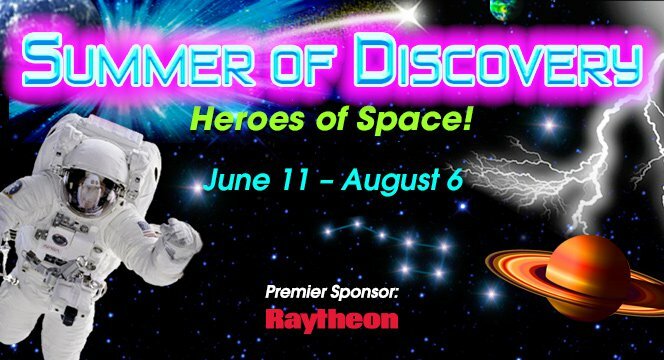 The Premier Sponsor for Summer of Discovery is Raytheon, with co-sponsorship by Chick-fil-A, Dell, iHeart Radio and Orbital ATK. Discovery Center is located only five minutes from Garden of the Gods Park, at 4425 Arrowswest Drive, Colorado Springs, the Space Foundation Discovery Center is the region’s only space, science and technology attraction.